Since January we have been trying to simplify. But not just simplify, redirect that attention to God. One thing we discovered is we have too much stuff, plain and simple. Stuff shoved in closets. Stuff under beds. Stuff covering every square inch of our house. So after gathering a bunch that we did not need, we decided to do 4 different things with the stuff… 1. Give it away. 2. Sell it on Ebay. 3. Sell it on online Garage Sale pages on Facebook. 4. Have a garage sale. Each had its pluses and minuses. But I think the biggest plus of all is that we don't have so much stuff in our lives to distract us from God :). For the next few weeks I am going to share a post on our experience with each… and I highly encourage you to simplify too, it has been a great experience! So let's get down to it… Sell stuff online on Garage Sale pages on Facebook. *Find groups in your area. Sometimes you can just search for these. But I would really talk to people and have someone invite you to the ones they recommend. *Pay attention to specific group rules. Some groups have specific things they allow and/or specific rules to follow. Once I unintentionally posted something incorrectly and was booted from the group all together! And I lost the opportunity to sell other things that would have sold best on that board. 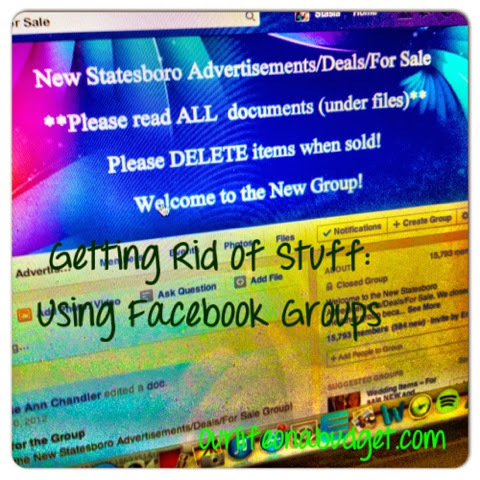 *Find groups that sell specific things. I have especially found success with this with baby stuff. People always love to buy it used and you can post to with a group uncluttered with furniture, broken iPhones and DVDs. *Group things if you can. I try not to sell anything that I am not going to make at least $3 on. Then I also try to put like things together so that I can sell more items. *Plan your drop offs in a safe public place. I think this goes with out saying :). *Plan your drop offs for when you are already out. Making a special trip out to make a few bucks probably isn't worth your time or money. I always try to plan around when I am coming home from work or when I have to go to the grocery store. *Make a designated area/box for the stuff you are selling. Much like my eBay box, this kept all the stuff I was selling available and organized! *Post with pictures and price. The pictures do not have to be as thorough (especially in number) as eBay but they do have to be decent. *Post and repost. Most groups allow you to post and repost every so often. Repost at different times a day so different people can see your post. *Watch your time investment. I try to make at least $15 an hour with a goal of $20 an hour that I work. this includes the time it takes to take pictures, post and make the sale! Remember your time is worth money too. * If you are unsuccessful, get rid of it! Not everything will sell… don't keep the junk laying around. Look out for my next post about garage sales… a great way to get rid of a bunch of junk stuff quick!